I’m feeling brave today! I’m ready to take on the sacred cow of tipping in North America. Tipping me for writing this blog post is just as ridiculous as tipping your hairdresser. Where does it end? If I tip waiters and hairdressers, why not tip the postie (postal worker) or the guys fixing the potholes on the road in front of my driveway or the bus driver or the woman serving me at the supermarket or the guy who gave me directions when I was lost? They all did something that directly benefited me and many of them are on pretty crappy money. USA is a kingdom built on tipping. 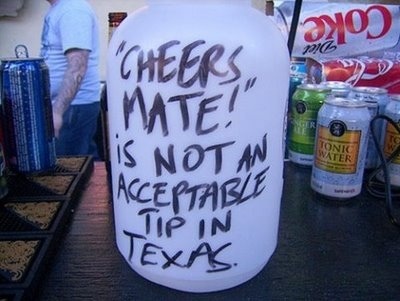 I feel bold enough to say that no-where else in the world has a tipping culture like the USA. You have to tip waiters, bartenders, hotel staff (maids, concierge, porters, shuttle/bus drivers, valet parking attendants), casino dealers (this is actually illegal in Australia), tour guides, hairdressers (plus extra for the person who washes your hair), masseurs, spa/beautician workers, taxi drivers, mechanics (some people tip, others don’t), ski instructors, dog groomers, etc etc. And it’s not just an expectation for a little tip. Usually we’re talking at least 15% of the bill. In Canada it is a little better, but there is still a tipping culture and expectation, particularly in restaurants. In Australia, I sometimes tip in restaurants, but only if the food and service is particularly good. 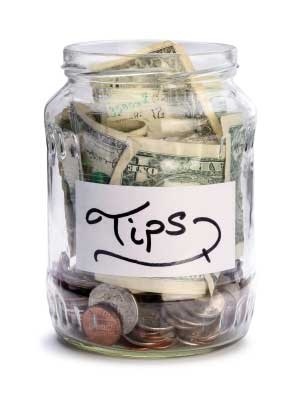 Tipping isn’t expected, but often people leave a little extra, but no-where near 15%. As for other services, it is virtually unheard of. My hairdresser wouldn’t know what was going on if I offered her a tip! The biggest argument for tipping is that people in service industries in the US, such as waiters and bellboys get paid below minimum wage (the US government allows employers to pay a significantly reduced wage if it is deemed to be a job that receives tips). This means that waiters rely on the tips to live, as they are not getting enough money through salary alone. There is also the practice of ‘tipping out’ where the waiter gives a percentage of their tip to the bartender or other workers. This can water down the true amount of the tip that they receive. I believe the minimum wage situation in Canada is a little better, but the same argument still applies. The other argument for tipping is that it ensures the customer gets better service. How the wage system is set up is not the fault of the waiter (or people in other service professions), but that doesn’t mean I have to like it or agree with it. I sympathise with workers having to earn a living through tips, but I believe that in an ideal tipping world (ie: many countries outside North America) you should pay one price for the full service. I don’t understand why it my responsibility to bring someone’s wage up to minimum salary level. Does the employer or Government have a role here? My biggest issue is the expectation that there will be a tip regardless of the quality of service. If I get crappy service I should not feel obliged to pay a tip. If I get outstanding service I might decide to throw in a little extra, not necessarily the hefty 15%+ expected. The argument that tipping gets you better service may be valid in a busy bar when you pay as you go for each drink. You will often find that good tippers get served first. Or if you tip the maid who cleans your hotel room each day she might take extra care. However, generally you tip at the end of a service, so unless you are a regular customer, the person providing the service won’t know how much you will be tipping. I also have an issue with the inconsistency of who gets tipped and who doesn’t. There are many low paying professions that don’t get tipped. Childcare workers, cashiers, farm workers, janitors, the list goes on. Should we start tipping everyone? The thousand dollar (or $1150 including a tip) question is – Do I tip? I just don’t like doing it. The only exception is if I travel to a third world country where I can see that a little extra makes a huge difference. I also feel really awkward and fumble when I give a tip. I don’t know exactly how I should act or pass it over. Do I need to be discreet (and if so why) or just fork it out? Silly I know, but when you haven’t grown up with tipping it is a very different custom. Feel free to tip me or throw stones at me!!! Or you could just comment instead! This entry was posted in Money, Uncategorized and tagged australia, canada, tip, tipping, travel, USA, writing. Bookmark the permalink. I hate tipping, too. The worst experience I had was this one time I was getting my nails done. This lady had hold of my hand, and her little servant girl came trotting over shaking a tips can at me. I mean, she hadn’t finished her work yet! She could have taken my finger off and she’d still get my $10. So I didn’t put anything in the jar, and then the lady screwed up my nails while yelling in Korean to her servants. Probably about how terrible I am. Thanks for commenting. It’s all about the expectation of tipping that gets people’s feathers ruffled! We must be well known overseas for when I was in the USA back in 1991 on a Contiki bus tour we decided to go back to our hotel by cab. When we arrived we all threw in for the fare and we decided we would give him a tip. So I looked in my wallet and all I could find was a five dollar note and I said here you go. As he took the money he said you wouldn’t be Aussies would you. We all laughed but somehow the cabbie didn’t think it was amusing !!! We definitely have a reputation Terry! I completely agree with your point of view Nic. I would like to be able to tip for truly exceptional service (which sadly is rare these days) rather than be expected. When we tip (if we do) we get a bit embarrassed in case it’s not enough and usually hide it in the bill folder, and quickly exit without making eye contact and just quickly waving thank you – how bad is our form! I agree, I hate the tipping thing! It feels like emotional blackmail somewhere like the U.S. I like to choose when and how much according to service and circumstance. I agree with your point about subsidizing an income that the employer should really pay adequately. Thanks! Hey – maybe your kids could start tipping you for dinner, washing etc etc!!! Not selfish at all – just how it is! Thanks for commenting.